Supporting deals focus on low-carbon energy, natural resource protection, and disaster risk reduction. 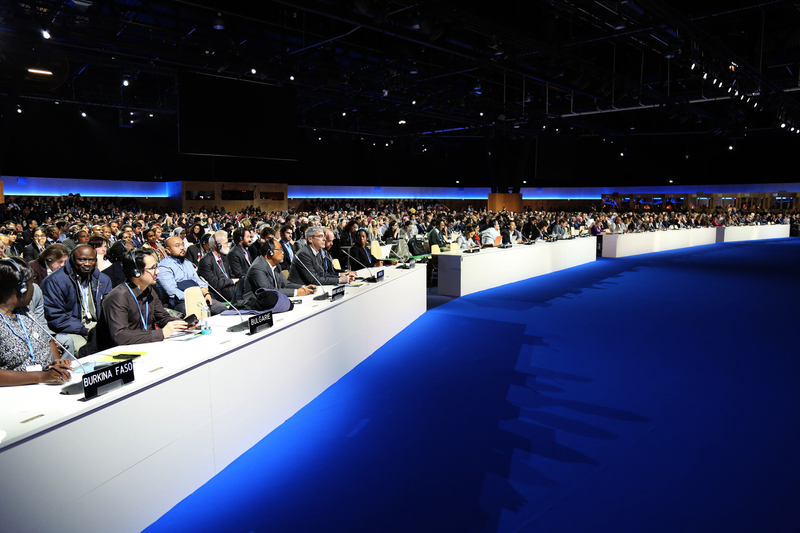 Approximately 25,000 official delegates from countries and organizations around the world are in Paris to negotiate the first legally binding global climate accord. Additional deals aim to make the overarching agreement a reality. Countries, businesses, and NGOs served up a steady stream of commitments during the first week of the UN climate negotiations in Paris to rein in carbon pollution and adapt to a warming planet. The menu of agreements, initiatives, and funding pledges runs the gamut from solar development and electric cars to early warning systems for natural disasters. The Paris Pact brings together nearly 290 water basin organizations around the world with the aim of improving water management and infrastructure to protect water supplies from climate change. Projects under the pact include groundwater management in India, water supply assessment in the Mediterranean region, building climate resilience in Africa’s Niger Basin, and hydrological and meteorological monitoring in the Congo River Basin. A number of the projects are backed by the World Bank. Sixteen countries released a joint statement acknowledging the vital role forests play in both trapping climate changing emissions and contributing to climate change when they are cut down and burned. Colombia announced a new partnership with Germany, Norway, and the United Kingdom to reduce deforestation in the Amazon. The three European countries also committed $US 5 billion over the next five years to countries who pursue REDD+ programs, a United Nations initiative to encourage sustainable development and prevent deforestation. In addition, the United Nations Framework Convention on Climate Change (UNFCCC) released a new online tool to track results and payments under the REDD+ program. A group of 20 countries, including China, India, and the United States, announced that they will double their current investments in clean energy research and development to $US 20 billion over the next five years. The initiative also includes commitments from 28 private sector investors to help translate clean energy research projects into businesses and marketable products. France announced plans to invest nearly $US 2.2 billion to support renewable energy in Africa. The announcement said the type of renewable energy projects will depend on each country, but could include hydropower, geothermal, solar, or wind. Introduced by UN Secretary-General Ban Ki-moon, the new Climate Resilience Initiative will help communities prepare for and adapt to droughts, floods, and rising sea levels. The programs will focus on the communities who are most at risk, including those in the least developed countries, small island countries, and countries in Africa. “These are the people who did the least to cause climate change, yet they stand to lose their homes, their jobs, and even their lives because of the growing impacts of climate change,” Ki-moon said. The CREWS initiative will improve early warning systems for floods, storms, droughts, and other climate-related disasters. Early warning systems monitor weather patterns and forecast natural disasters, issue emergency alerts to the public, and notify emergency response teams. Supported by the governments of Australia, Canada, France, Germany, Luxembourg, and the Netherlands, CREWS will focus first on the least developed countries, small island countries, and countries in Africa. These supporters have already pledged $US 80 million to the initiative, which will help update warning systems in as many as 80 countries. Members of the alliance, which includes 20 countries and more than 60 organizations, will seek to reduce emissions from the construction industry and make buildings and cities more adaptable to climate change. Its goals include improving energy efficiency, incorporating renewable energy sources, and making supply chains more sustainable. The declaration pushes for greater adoption of electric-powered cars, buses, and other modes of transportation, with a goal of achieving electric power for at least 20 percent of all road vehicles by 2030. The declaration includes commitments by governments, businesses, and other organizations. A new, interactive graphic unveiled during the Paris climate talks catalogues the financial commitments made by countries, businesses, and nongovernmental organizations to support projects aimed at reducing climate change and its effects. Some of the newest climate financing announced over the past week include a $US 1 million contribution from Paris to the Green Climate Fund, a $US 500 million commitment from Germany, Norway, Sweden, and Switzerland to help developing countries reduce their carbon emissions, and a $US 136 million commitment from the European Union to assist countries affected by a strong El Nino this year. A group of financial institutions, business and political organizations, and universities are planning a high-level summit next year to discuss and plan the implementation of the goals established in Paris.